One of the great things about this house was the 10-foot ceilings. It got my imagination going, knowing we could give these homeowners a beautiful storage and guest room layout, while still keeping the open, airy feel of their tall-ceilinged home. 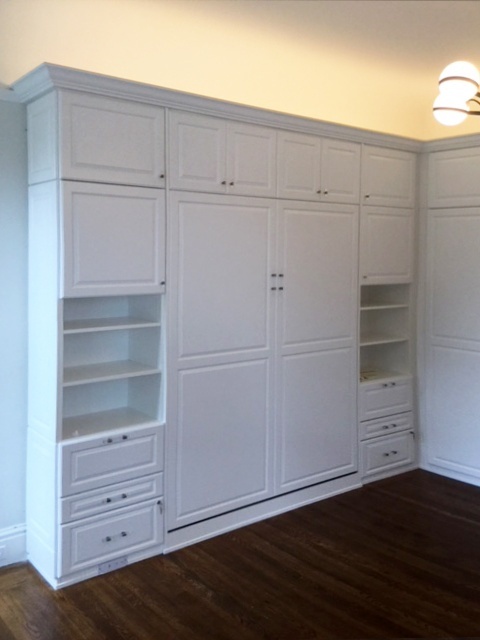 We wanted to use two walls of the room, one primarily for the wall bed, and the other for storage and closets. Some limiting factors were the heat register and electrical sockets, neither of which could be covered by cabinets. For the wall bed, they decided on a queen-size mattress for the best ratio of guest comfort and use of space. By putting drawers and cubbies on either side of the bed, I allowed for guests to get in and out of bed on either side, while also giving them side tables to stash items like a cell phone and wallet. Hidden electrical strips on each side of the bed meant no crawling around on the floor looking for an outlet to plug in your electronics. On the closet wall, I had to fit everything the homeowners needed between the wall and the heat register. 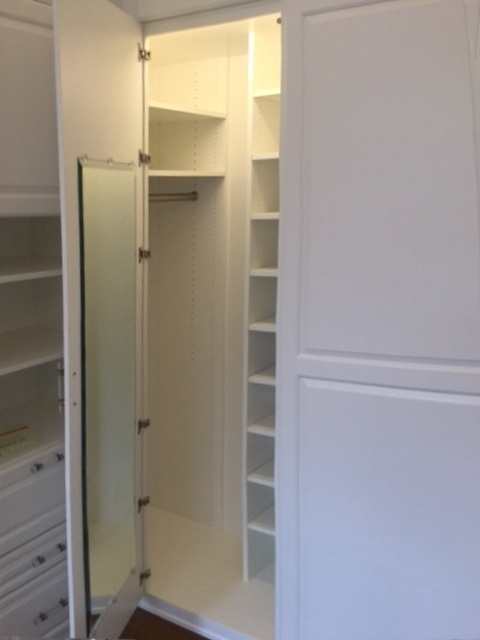 Since Valet creates each and every closet custom, I did not have to worry about fitting pre-fabricated units into an awkward space. 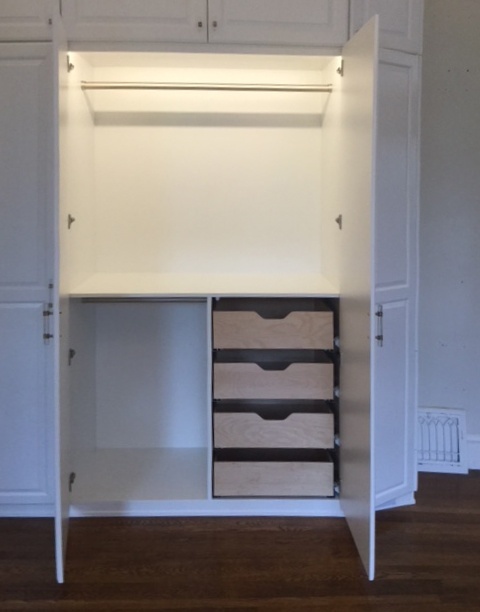 I was able to design exactly what we needed, using every possible inch for maximum storage. The main part of the closet was designed for hanging clothes. Standard height for suits, shirts and skirts worked well with the tall ceilings, since I could do a double hang system. They also wanted some drawers. In order to keep the look of the closet streamlined, I used roll-out trays inside the closet doors. The advantage to these is that you can see what’s in each drawer simply by opening the closet. But what about that often-wasted space in the corner? Not to worry. Here, I designed a clever corner closet to utilize the area, while still keeping it easy-to-reach. I simply placed adjustable shelving adjacent to a taller hanging area with a mirror on the door. And to transition from the deeper closet to the room’s double glass doors, I added a wedge cabinet. 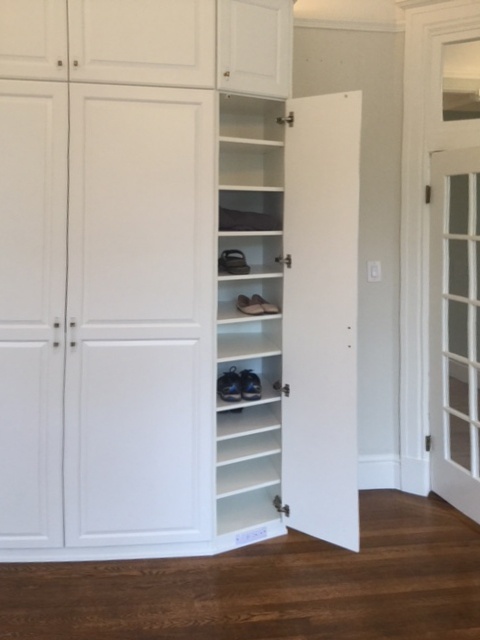 The homeowner’s current plan is to use this for shoes, but the adjustable shelving makes it easy to change their storage solutions if they change their minds. Above-the-bed cabinets are hard to reach, so these are ideal for storing off-season items like heavier bedding or holiday decorations. And with those fabulous 10-foot ceilings, I was able to install accent lighting above the cabinets which brightens the room when used along with the chandelier, or it creates a cozy mood on dark winter nights when used by itself. Although the wall bed and closet take up a significant amount of the room’s walls, the visual effect is one of brightness with an open feel. The choice for White Laminate and clear pulls creates a simple and elegant multi-use space. 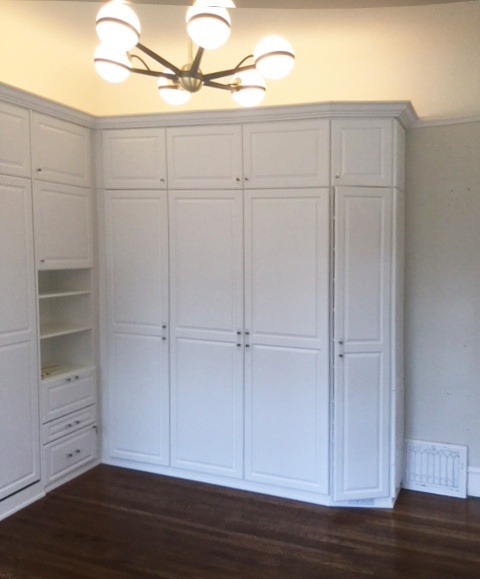 And by using every inch for the most impact, these homeowners have a storage solution that will work for them years into the future.